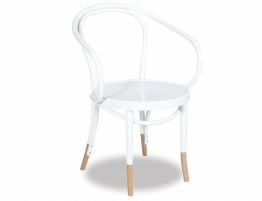 Look at the B9 armchair seen here, it is light, airy, even graceful, yet it is strong and durable making it perfect for oft used kitchens and dining rooms. 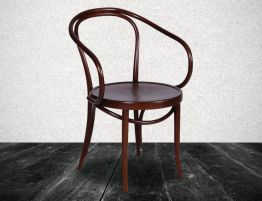 Michael and August Thonet created some of the most lasting designs in furniture history. 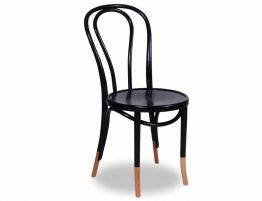 Even past their deaths, the family company continued to produce millions of their iconic chairs, along with newly imagined bentwood and tubular steel creations. Going strong even today, these designs get revamped and revisited, making them fresh and timeless. 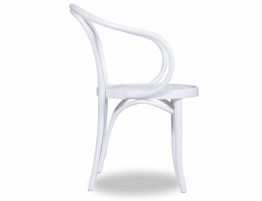 The LeCorbusier B9 armchair itself here in natural with white “socks” would look equally at home in a rustic farmhouse as a chic modern home.Shown in white with natural toned “socks” and a sunburst seat patterned seat, our Le Corbusier B9 bentwood arm chair offers the best of craftsmanship and design. 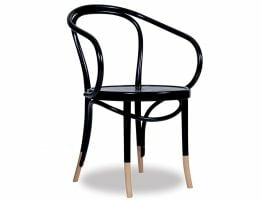 The furniture of Thonet’s time was so often constructed from flat expanses of wood with a great many joints disguised by ornate carvings. Manufactured furniture was understandably out of reach for most people. 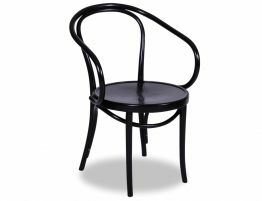 Thonet sought out easier and more affordable ways of manufacturing attractive, well made furniture. 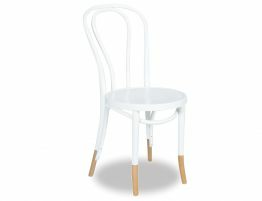 Thonet processes that are still widely used today over a century later.